Virtually every character in Trashed is off in some way. Some are quirky, such as the garbage collector who collects old pianos that are discarded by their former owners. Others are just trying to get through soul-crushing jobs. A few are jerks whose purpose in life seems to be to take bad situations and make them worse. What they have in common is that, at least as Derf presents them, they will fascinate you. The original “Trashed” tales were based entirely on Backderf’s own time on the truck. This longer, more thoughtful work is less memoir and more examination of the bad choices mankind keeps making when it comes to creating and disposing of trash. There are scenes that stick to my thoughts like the stickiest of trash bags. There’s a full-page shot of a family of four dwarfed by the mound of nearly 1500 trash bags they will create in just one year. This mound weighs over 7000 pounds. The book’s discussion of “foreclosure trash” is heartbreaking. The remnants of a family’s time in the home they were forced to leave, are left for the garbage collectors. I got something in my throat when the characters opened a box of family photos, wondered what to do with and ultimately tossed it into their truck with the rest of the trash. That’s real cold life. 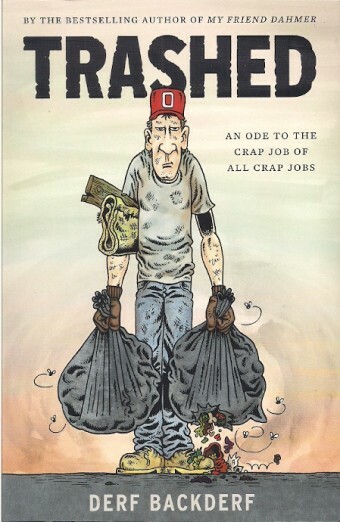 Trashed would make a great gift for comics readers who like slice of life graphic novels, for readers interested in what we’re doing to our planet and for readers who may have worked small city jobs in their life. I’m not sure what categories this book belongs in, but I’ll be disappointed if it doesn’t pick up a nomination in next year’s Eisner Awards. Rocky and Bullwinkle Classics Volume 1: Star Billing [IDW; $17.99] reprints Gold Key’s Bullwinkle #1-4 from 1962 and 1963. Back then, I was something of a super-hero snob. I bought all the Marvel and DC super-hero comics I could afford. When I had extra cash, I’d buy adventure, monster and science fiction comics from those and other comics publishers. My humor purchases were few, ACG’s Herbie and, when I could sneak it past my parents, the occasional issue of MAD. 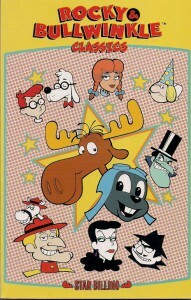 Even though I was a huge fan of the Rocky and Bullwinkle cartoons on TV, I never bought their comic books. That, as it turns out, was my loss. The Rocky and Bullwinkle cartoons were entertaining for all ages. There was always enough action and comedy for younger viewers, but older viewers would enjoy other levels of humor that the youngsters wouldn’t even realize were present. The cartoons, including Dudley Do-Right, Fractured Fairy Tales, Peabody’s Improbable History, were both hilarious and smart. They make me laugh to this day. These comics are most often credited to writer/artist Al Kilgore, but this collection states â€œartists Fred Fredericks, Jerry Robinson and Mel Crawford likely contributed artwork to stories written by Jack Mendelsohn, Dave Berg and others. That’s an astonishing array of talents. No wonder these comic books are so great. There are four volumes in the Rocky and Bullwinkle Classics series and any of them would make a great gift for a fan of the original cartoons or for comics readers looking to expand their knowledge of some of the unsung classics of our art form. 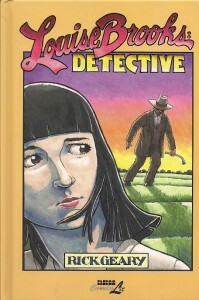 Fans of Rick Geary’s Treasury of Murder books will likewise enjoy the cartoonist’s Louise Brooks: Detective [NBM/ComicsLit; $15.99]. Its title heroine is real-life silent movie actress who was “on the verge of stardom” when she decided against renewing her contract with Paramount Pictures. She made a notorious film in Germany and appeared in two other European movies. She returned to Hollywood in small parts in small films, danced in nightclubs and, in her 30s, retreated to the home of her parents in Wichita, Kansas. In this graphic novel, Geary re-imagines his favorite actress and embroils her in a tale of murder every bit as engrossing as any of the real-life murders he’s previously adapted into graphic novels. This new work has the same darkly droll attention to character and detail of his other works. It is an American crime story played out in rural towns and utilizing the elements Alfred Hitchcock always used to great effect: odd characters, unexpected bursts of action, an ever-present sense of danger and the arm-gripping suspense that grips a reader or viewer until the story’s finale. As a holiday gift, I think Louise Brooks Detective would delight Geary fans, silent movie buffs and mystery lovers in general. I am hoping we haven’t seen the last of this bright new detective hero.